FREEVIPQUOTE Insurance has provided comprehensive insurance (including specialty and hard-to-place insurance) in Illinois and Wisconsin since 2009. 4-Color Process Letter Size Two Pocket Folder, side 1 printed with four-color process on 14pt C1S White Semi-Gloss stock, coated with Aqueous Gloss and H4 business card slits on the left pocket. 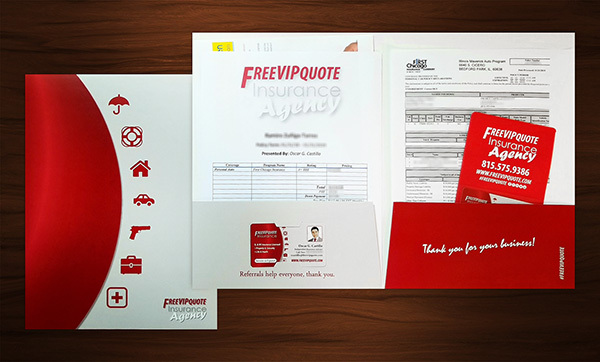 Oscar G. Castillo, Independent Insurance Advisor at FREEVIPQUOTE Insurance, needed custom-printed presentation folders for customers’ insurance quotes matching his company’s style and brand. Castillo purchased 250 presentation folders to complete his marketing packet. It was his first time working with Company Folders, which he said he found through an online search. He said he had been planning to order presentation folders for about 18 months. During this time, he collected various samples from colleagues and other insurance providers. He also called Company Folders several months before placing the order to double check prices and get more information, which helped him make his decision to go forward. Having purchased various personalized promotional products in the past through several companies, Castillo said he was nervous about ordering presentation folders. “It is a stressful situation every time I go through that,” he said about ordering other promotional items. Castillo chose the 4-Color Process Letter Size Two Pocket Folder. 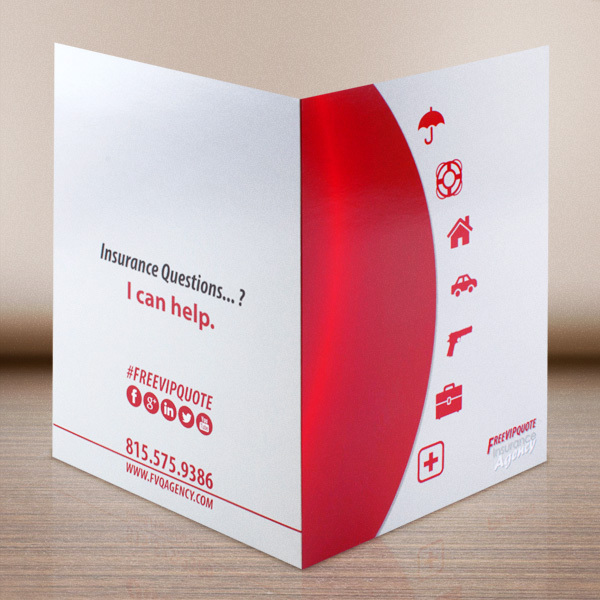 It’s printed with four-color process on side 1 of the 14pt C1S White Semi-Gloss stock and coated with Aqueous Gloss, with H4 business card slits on the left pocket. 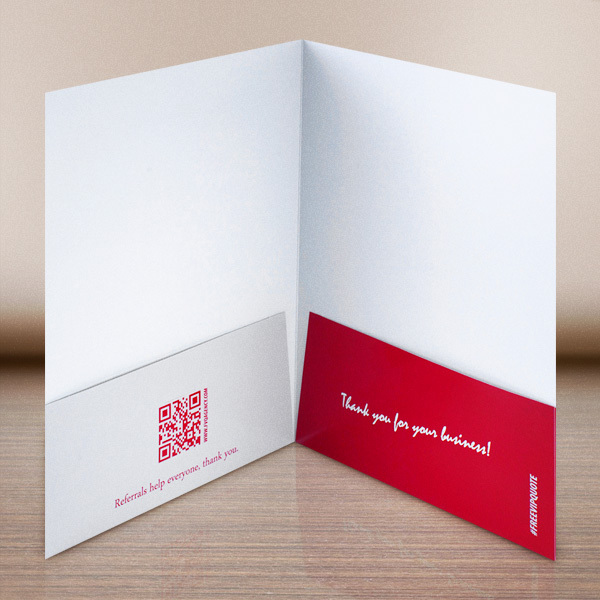 It was during one of those quality checks that an issue with the business card slits was discovered. Castillo said he was impressed Grubb would notice that. In addition to working with Grubb, Castillo also worked with two other members of the Print Project Team. He started the process with Grubb before she left for vacation and was able to finish it seamlessly despite her absence. He said he was impressed with the consistent information Company Folders staff gave him when he called, regardless of with whom he spoke. It was this consistency that helped ease his fears about purchasing another custom-printed product, he said. He said he plans to order from Company Folders again. He said he’s already recommended Company Folders to two of his colleagues.